Not a command from on high, but a plea from local residents of Woodside Rd who have been struggling to get the message across to Council for years regarding the dangerous dark spot across the footbridge through Woodside/Riverpark Reserve to Sunline Avenue. But dealing with bureaucracy is like dealing with a many headed Hydra, none of which seems to know what is going on and what has been agreed on in the shuffle of Councils. Meantime the worst happened and someone got mugged on the footbridge. WesternLeader_5July2012 Here is a chronology of events. Ian Miller, committee member from the Riverpark Action Group and member of Massey-Birdwood Settlers Association, presents the case for lighting for the Sunline Avenue/Woodside Road bridge, which is located in Woodside Reserve. “Agree that the installation of lights in the Riverside Reserve/Woodside Road Park be requested to be included in the Parks Programme Plan for 2011/2012”. We were subsequently advised by John Riddell (Massey Community Board Chairman) on 1 September 2010 via email that the lights would be put into the budget for 2011/2012. Meets with Ian to discuss location and lighting type. Ian is interviewed and photographed for the article. Mark Bowater – Auckland Council manager of local and sports parks – is asked to comment and confirms lighting is included in the budget for 2011/2012 and would be installed in November 2011. Meets with Ian onsite to discuss location and lighting type. Mark Miller was also present. The planned and budgeted lighting works for 2012/13 are to install a total of six new lights at Riverpark Reserve; two new lights to the car park and four new lights to the walkway leading from Woodside Road to Bittern Place. The area you highlighted to us – Woodside Road to Sunline Ave (across the footbridge) would benefit from some lighting – as we indicated at the site meeting, there is currently no unallocated budget for 2012/13 but I will organise some costed options for the area so that they can be considered for the following year (2013/14). Improve park safety for users of the car park and footpath. Provide lighting levels to the appropriate lighting standards. Minimise the number of poles used. Minimise light spill beyond the target areas, taking account of the nature of the esplanade reserve and nearby properties. The proposal is to use two 80W white light LED luminaires for the car park and four 30W LED luminaires for the park footpath. These would be fitted with the appropriate optics to minimise light spill beyond the target area. At this stage I don’t have a specific timeframe – once I have a proposed start date, it is standard practice to send a notification email to the Local Board, Ward Councilors and other interested parties, so I can ensure that I send one to you too. Mugging incident on the footbridge. 9 JULY – Jacqui sent an email to Mark Miller noting the recent attack on the bridge (30th June) reported in the Western Leader and asking for action and for the lighting project for the footbridge to be given priority. 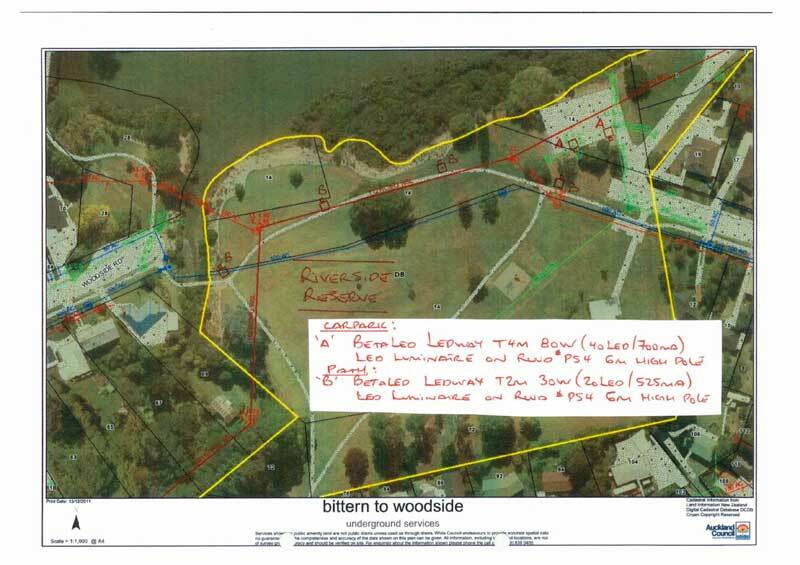 Mark’s confirmed that his understanding (presumably from previous council staff) was that the proposed lighting through Riverpark Reserve was already programmed into the Auckland Council amenity/parks lighting programme well before our group first contacted the council. Our concern is that we requested lighting for an area where public safety is at risk (between Sunline Avenue – Woodside Rd) but the council has chosen to make a decision to install lighting elsewhere in spite of our submissions. Mark advised us that this is not a case of mis-translation, but simply that the council has limited resources, and the route through Riverpark had already been identified as an important thoroughfare that required lighting. We are unsure of who had decided this since we couldn’t find any records of anyone requesting lighting for this area. However, there was good news for us. Mark told us that he would be meeting the lighting contractor and would get a quote for lighting of the route from Sunline Ave through to Woodside Road (including the footbridge across Swanson Stream) so that he could assess whether there was any opportunity to re-prioritise the planned lighting for 2012/13. 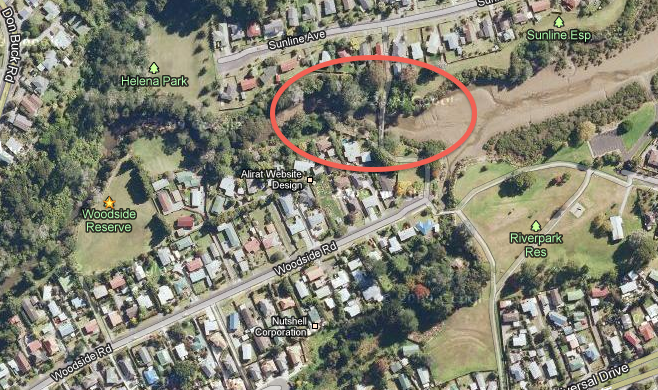 He also indicated that he would ask for the area to be assessed by the Auckland Council Community Safety Team perhaps with a view to removing some of the vegetation and opening up lines of sight. He asked for Michael Alofa to assist with this assessment in his role as Council Crime Prevention Officer. We were also given an assurance by Mark that if there was any opportunity to include the lighting in this year’s programme he would do so, so we felt quite encouraged by that. REPLY from Jacqui asked for the Community Safety Team to take a look at the bridge/walkway after dark. Mark met with the lighting contractor on site, and asked him to provide a lighting plan and estimate for the works. He also asked the Council’s Community Safety Project Leader to visit the site and provide any suggestions to improve the area, through CPTED actions. He observed that there were some pruning works that the council could carry out on non-native species at the Sunline Ave end of the bridge, which might open up lines of sight. Initial comments from the council lighting contractor were that it wouldn’t be possible to light the alleyway leading from Sunline Ave, as the light spill to the neighbouring properties would be too great. However, he did think that the remainder of the route could be lit reasonably effectively with four or five lights. Mark advised that the lighting for Riverpark Reserve will go ahead once the resource consent paperwork has been received. Time-frame will be advised to RAG in due course. Ian Miller enlists support for the project from the Henderson-Massey Local Board Chair Vanessa Neeson. Vanessa Neeson confirmed verbally (to both Ian and Jacqui) that the lighting for the footbridge has been assigned high priority by the Henderson-Massey Local Board. She has also spoken to Mark Miller. 3 SEPTEMBER 2012 – update from Mark Miller – some good news! Mark has been in contact with Michael Alofa (Community Safety) and we hope that Michael will make a site visit soon…after dark as requested! Mark has also assured us that he will do his best to get the lighting for the footbridge installed this year. We know that budgets have already been set but we really hope that this will happen. It will really demonstrate support and concern for our community. The Riverpark project has had a few changes made but should be submitted for building consent shortly. We hope to hear about those dates soon also. Mark confirmed that there was still no news yet from Michael Alofa from Community Safety with regard to the safety report. We have requested that someone else be asked to inspect the site if Michael continues to be unavailable. Mark has also reiterated that he does have limited budget in this year’s programme to allow designs and consents to be sorted out this year. It’s probably unlikely that there will be sufficient funds to actually install the lighting so he expects that physical works would probably occur at the beginning of the 13/14 Council financial year (July 2013). We hope that if the community safety report supports our concerns that there might be a possibility of the project receiving a higher priority. Let’s hope that inspection happens soon! 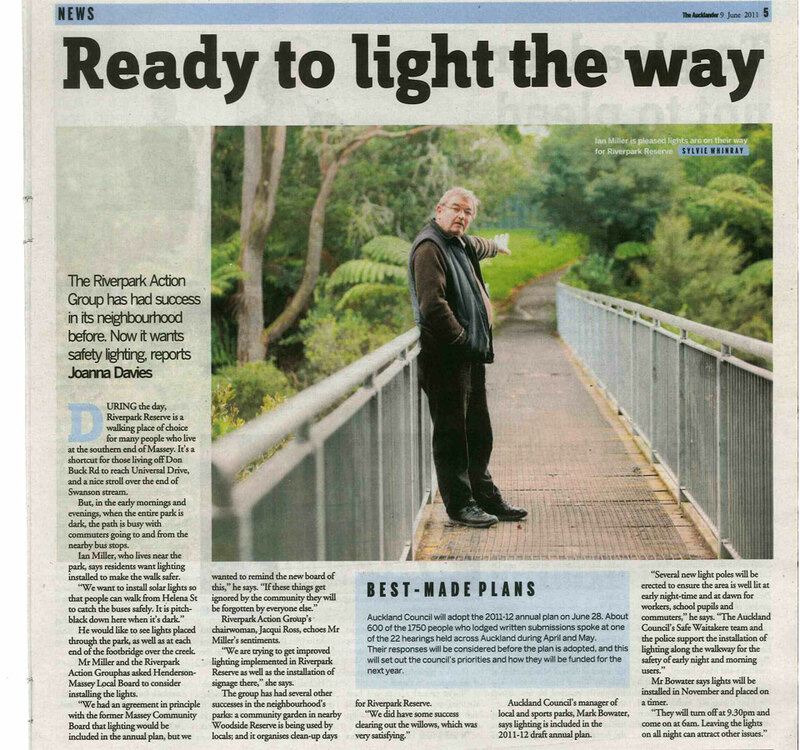 In the meantime, the Riverpark Reserve lighting project is still under consideration for resource consent. Have a look at the plan below if you are interested in what will be happening there. Lighting was installed in Riverpark Reserve earlier this year as per the plan above. See story. It’s working well except that the lights are going off at about 8:30pm at present. We continue to discuss this with Auckland Council representatives and hope that we will be able to get the operation time extended to 11pm to cover times when people are walking through the reserve from the bus stops on their way home. The lights are really bright and low cost/energy efficient as they are LEDs. We have requested one more light be added to light the path that extends directly through to Universal Drive and that is currently being worked on by Auckland Council. It is forecast to be included in the budget for 2014/2015 if funds allow. The footbridge lighting project is going ahead with lights forecast to be installed in a few months time. The neighbours have been consulted by Auckland Council. Lighting will be the same as those installed in Riverpark Reserve, i.e. LEDs, due to their brightness, energy efficiency and low running cost. Solar lighting was considered but ruled out due to the need to have a back up. As with the Riverpark Reserve lighting, we hope to have the footbridge lights on up until 11pm. The bamboo stands have been removed and treated to improve visibility down to the footbridge. Low level planting will help to protect the slope from erosion while still allowing good visibility. Rubbish dumping continues to be an issue on the Sunline Avenue side of the footbridge but we hope that the new planting to be carried out on 31 August will discourage this activity. Great news! The footpath has been moved, wiring and lamp posts have gone in. We may be removing our footnote comment soon. Read the latest here. We said “Let there be light” and now there is! See the photos in our “hopefully final” post! Not sure if this means it will happen or not but we live in hope. Watch this space. This roundabout, which is located at the junction of Henderson, Massey and Swanson/Ranui has become notorious for near misses. Now, Auckland Transport has produced a plan detailing proposed changes to this roundabout. According to minutes from the April meeting of the Henderson-Massey Local Board, this work was scheduled to begin in July/August 2012 (see page 10 of the minutes). Neighbourhood Support Waitakere (NSW) recently held a seminar for all NSW Street and Area Contacts. Representatives from the Fire Service, Civil Defence, Auckland Council, Waitakere Community Law Service and the NZ Police all gave presentations to the group.